If the 'singlespace' design is to be built it has to be built quickly, and largely with my labour. Therefore there is not time (and not skill, either, really) for fine carpentry or elegant carving. Yet the structure is going to be exposed and needs to look good. What I'm considering in this essay is how simple carpentry can result in an elegant structure. In my initial sketch of the structure I discovered that in order to avoid complex joins at the pillar heads, each pillar/ring beam assembly has to be rotated about the axis of the building by an odd multiple of the rafter spacing angle of the 'upstream' assembly. The rafter spacing of the inner ring is 15 degrees, and in both this drawing and its predecessor the second ring is offset by 15 degrees. The rafter spacing of the outer ring is 7.5 degrees; however, if you offset the outer ring by just 7.5 degrees it just looks odd and so in this drawing I've offset by 22.5 degrees. Every pillar has exactly one rafter running through it, and the pillar is slotted to take the rafter. 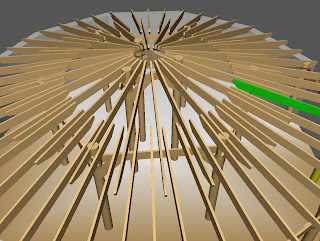 A single treenail positively locates the rafter to the pillar. Every pillar stands at the junction between two ring beam components. The ring beam components are joined with a mortice and tenon, and are then checked back into the pillar. Finally, they are lashed together round the back of the pillar, enabling a strong characterful joint. The ring beam components are notched slightly on upper and lower edges to positively locate the lashing. Each of the braces is checked into the pillar and fastened to it with two treenails. 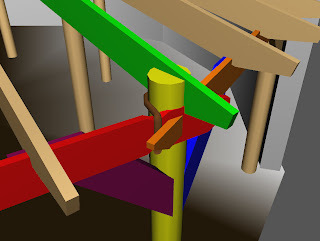 The brace is checked to accommodate the ring beam component it supports and fastened with two treenails; the joint might be a little more sophisticated than the one shown in this drawing, but I don't think it needs be. fair, even cone to the roof. Because the rafters cross the ring beams at a range of angles each needs to be checked in individually on site - I don't think it would be wise to do this in the workshop and hope to get it right! the rafters obviously cross two ring beams, one at the upper end and one at the lower. 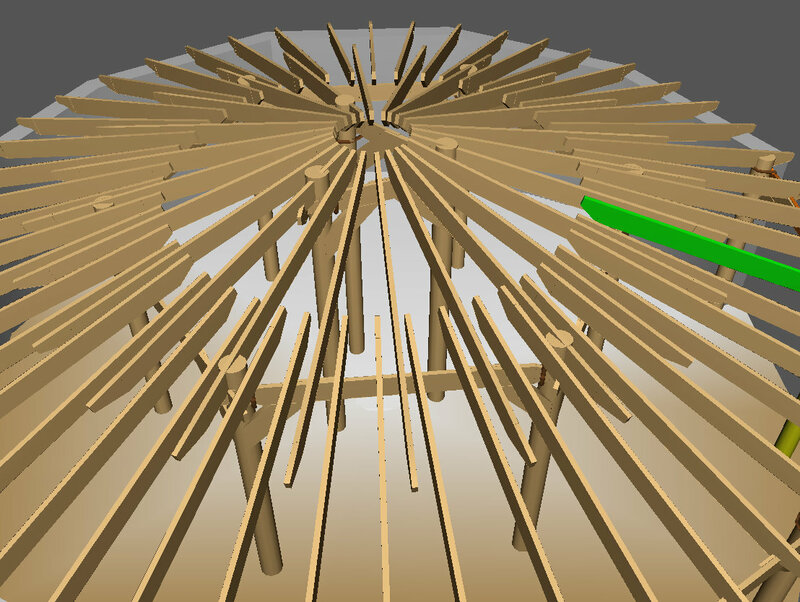 At the upper end, the rafter is checked (although the sing beam might also be checked slightly); at the lower end, only the ring beam is checked. Both ends of all the rafters are tapered upwards. The ends of the ring beam components are extended to a degree which is more than that strictly required for joint stability and again tapered. Exposed edges of rafters and ring beam components might be moulded with a router is there's time. My intention at this stage is still to use plain ordinary manufactured patio door units for the front wall. Obviously these aren't designed to be fitted into this sort of structure, but they will save a great deal of complicated joinery and will just work, so I think it's worth using them and doing the necessary joinery to make them fit (and look reasonably good). I plan to put them immediately between the front pillars, inside the braces of the ring beam components, rather than either outside the pillars or inside the pillars. Obviously, between the tops of the patio door units and the roof there will be a series of complicated-shaped holes which will need to be made good with 60mm closed cell foam board faced with T&G boarding inside and out. Finally - while this isn't strictly a joinery detail - both yesterday's drawing and todays show a polygonal wall for the back and sides of the structure. This isn't simply unnecessary - it will actually make fitting the waterproof membrane harder, because of the corners. So I now think a smooth circular wall with no corners would be preferable, and not greatly harder to build.